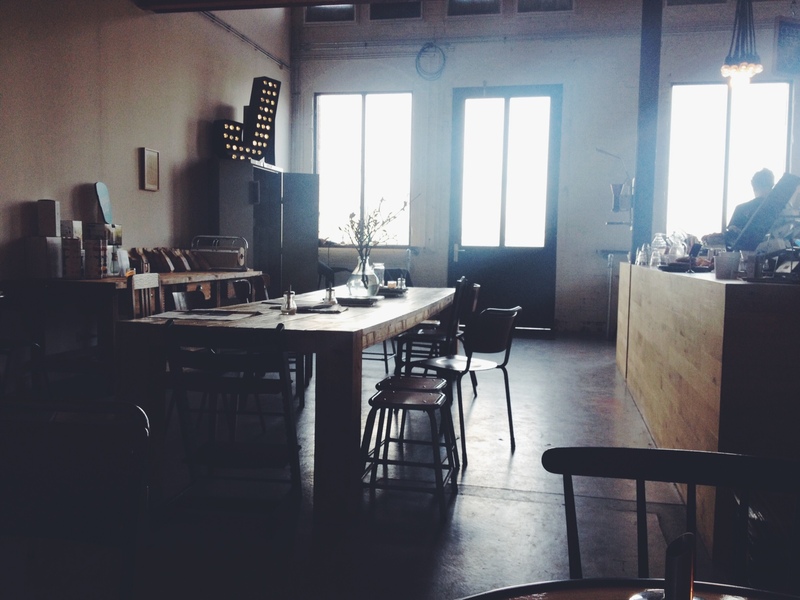 I’ve made a collection of my favorite cafes in Amsterdam, based on research from a few of my favorite Amsterdam blogs/people/sources. 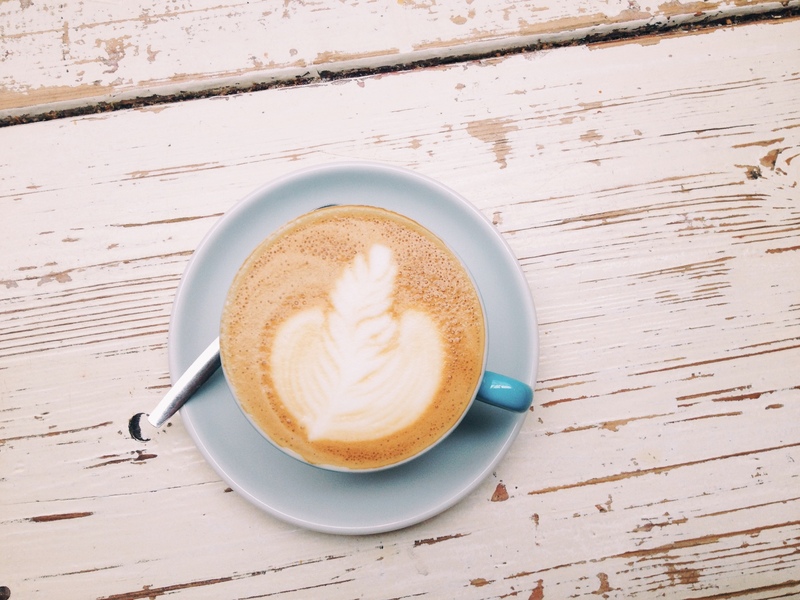 The list was created while on the search for the best cappuccino, but I might broaden my horizons and include food, too. I’ll be continuing this little project for the rest of my time in Amsterdam. Keep checking back! I’ve included the websites to each cafe because, surprise, they are almost as perfectly designed and Dutch as the cafes themselves. I have found the absolute prime working spot and it was hiding right in my neighborhood. 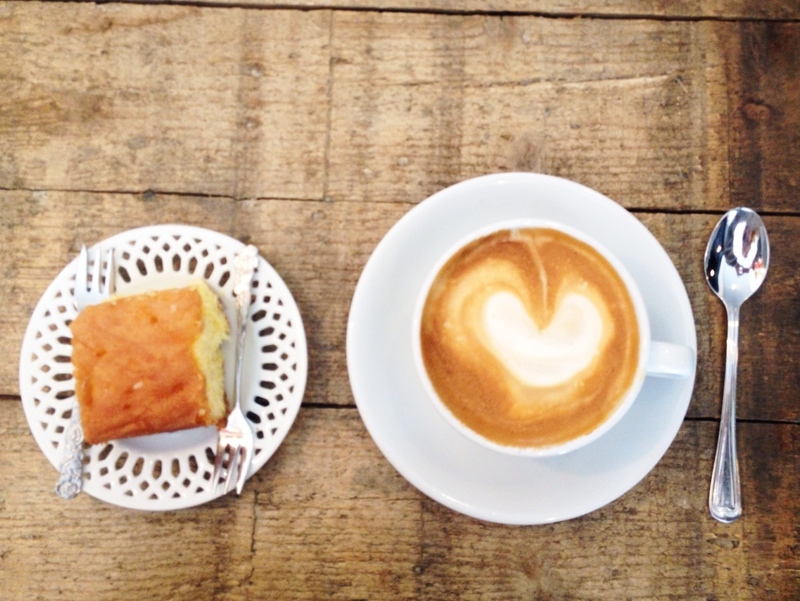 Espressofabriek is a larger cafe with plenty of light and seating located in Westerpark. There’s the actual park, then in the middle of the park there are buildings that house a few restaurants and a cool bar. Espressofabriek is at the end of the stretch of buildings but overall maybe a four minute bike ride from my apartment. When I was there it was pretty empty despite the perfect cafe weather (rain), but that only meant I could take pictures more freely and get my work done.Their cappuccino art was divine and I also loved the handle-less mug. Every candle was lit at each table and I love that. 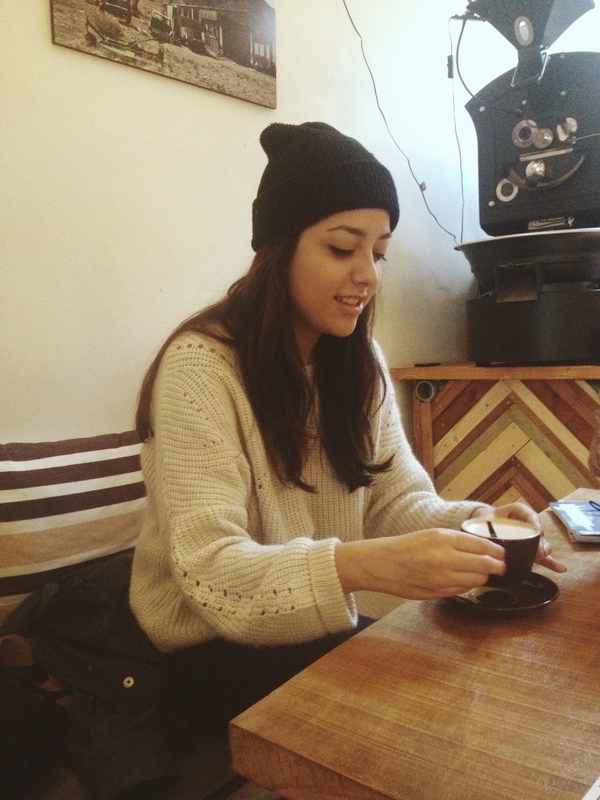 The barista was young and dancing, and playing a lot of great music. I think I loved this place so much because it is fiercly local. People would come in and talk to the barista casually (I could even understand them for the most part! ), and everything was casual and comforting. I’ll definitely be going back, but next time I’ll get their famous apple pie. I’ll also have to try a coffee that’s not a cappuccino next time, they look like they had some fancy options! 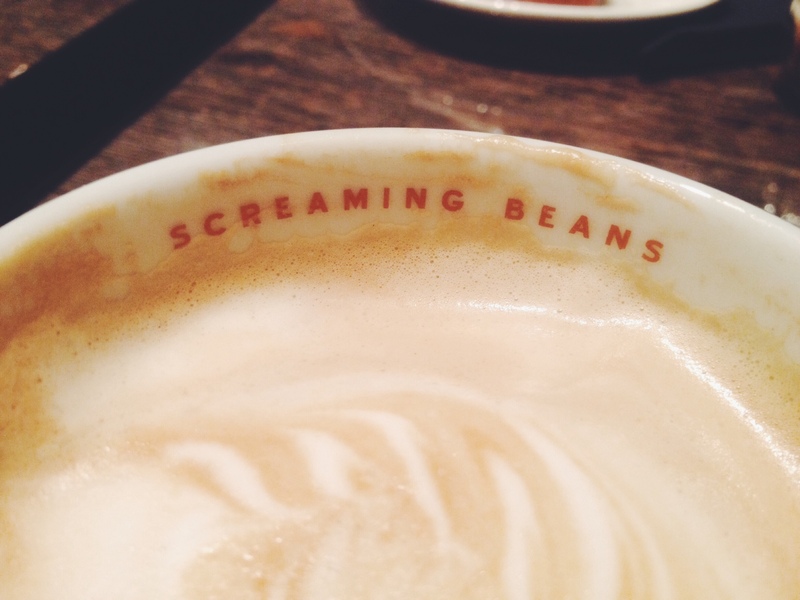 This wasn’t my first time at Screaming Beans, I went with a friend a few months ago. I’ll actually give her credit for finding this while she was visiting and needed to kill time while I was at class. 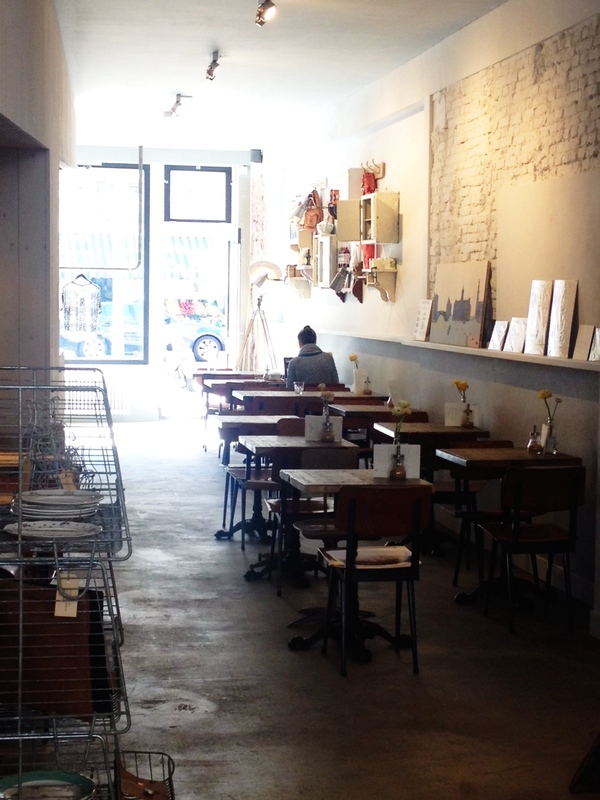 What’s not to like about a cafe in the nine streets? The pastries were beautiful; I got a classic piece of apple pie and Nat got a lemon meringue slice. Both had cappuccinos, of course! Something I’m learning is you sacrifice yumminess of foam for latte art. First world problems, but still. Screaming Beans had a lot of fancy coffee tools/machines to buy for the home that I can’t imagine ever using. I guess people get really into coffee… I just prefer the coffee lifestyle as opposed to knowing different beans or flavors. I definitely prefer the more rustic cafes as well, this one had really shiny tables that made my photographs not at fun. Yet another beautiful neighborhood favorite, right down the street from Six & Sons! 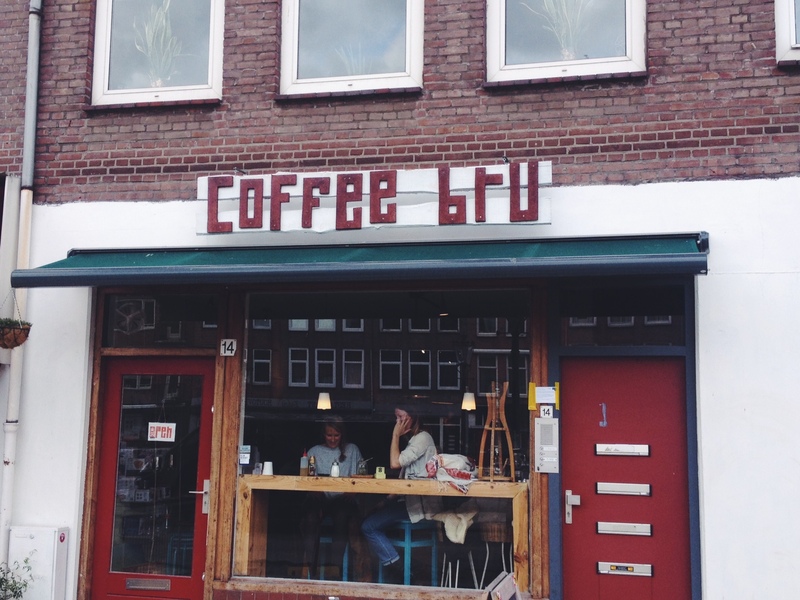 Nat introduced me to this cafe last semester, and she had learned about it from a Dutch friend. 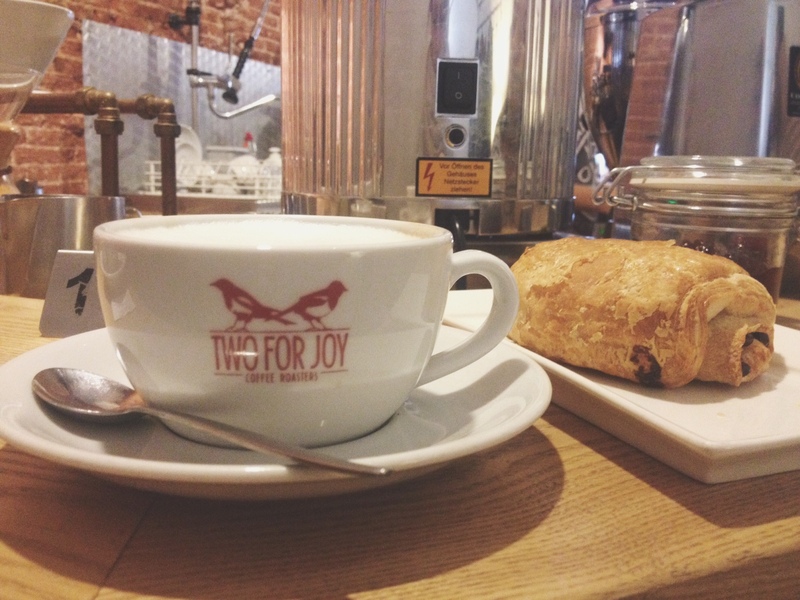 She had claimed Two for Joy to have the best cappuccinos/coffee in Amsterdam and my goodness, they sure are good. I probably love this place even more because of their little magpies logo and because the title is based off of the nursery rhyme. They have two locations but obviously we prefer this one. 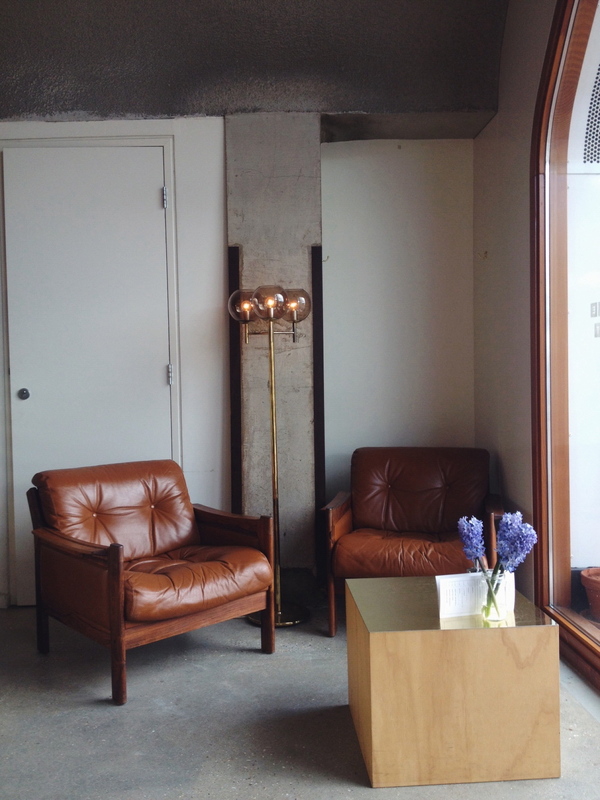 Like all great cafes, there is cozy seating on 3 different levels, with seats to either work or chat. 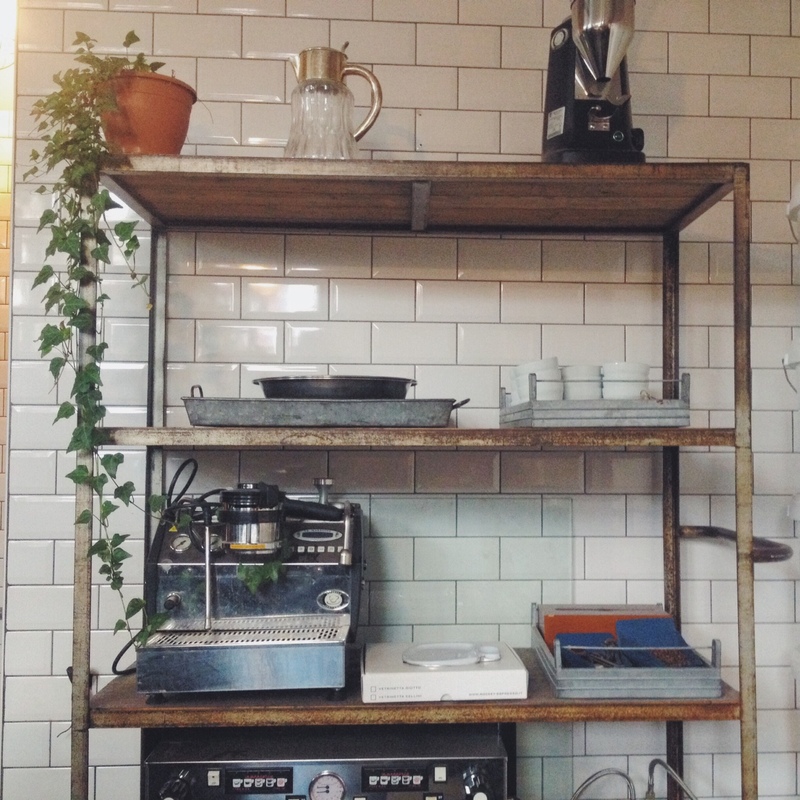 This trip we sat at the bar behind the espresso machines. It was nice to be so close to the baristas and watch them make yummy-looking hot chocolate. I don’t have a photo, but Natalie ordered an iced latte that came in a mason jar with a handle. I’d think I would have seen this more in Amsterdam but it was my first time. Everyone loves a good mason jar for a glass! The cafe sells mugs, espresso cups and their own coffee. The most fun part of the cafe? One of the employees actually made the furniture that is outside. 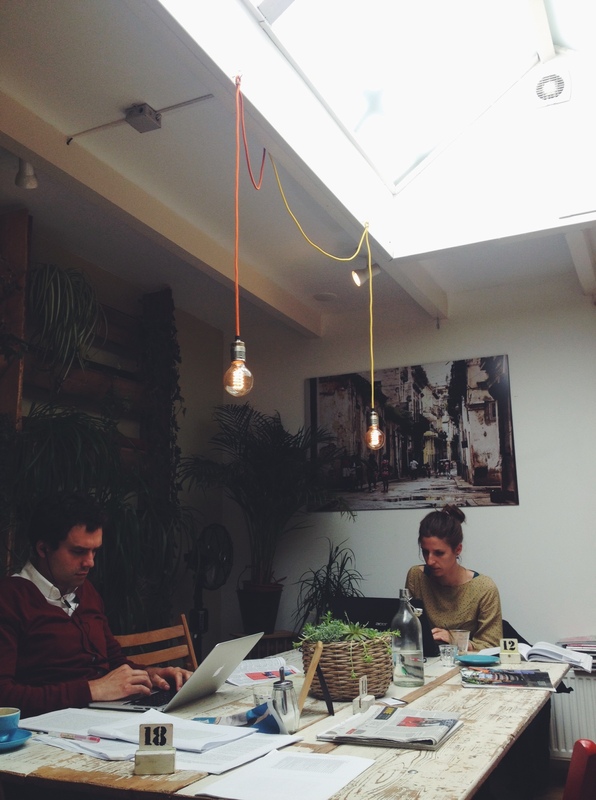 Of course a barista/furniture designer works there! Two For Joy interior, you can kind of see the levels. Found another concept cafe and couldn’t be more happy about it! 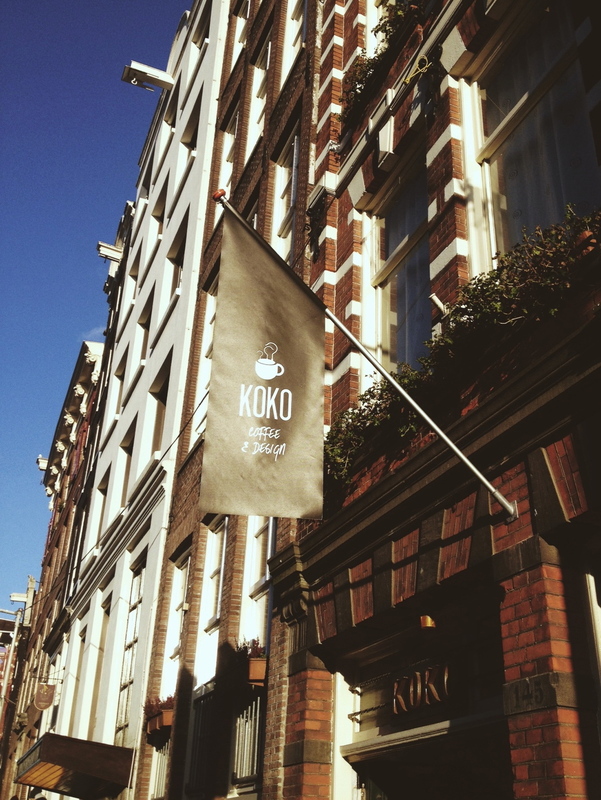 I saw KOKO Coffee & Design on the Maker’s website a while back but didn’t know what to expect. I’ll just describe it now as PERFECTION. The front is small but the actual shop extends back pretty far in a canal house in the Red Light District. The left side of the cafe is lined with beautiful clothing items, some paper products, jewelry, and couches while the right side has a small coffee bar and tables for sitting and working. The barista was incredibly sweet and welcoming but maybe she was just feeding off of the big smile that I acquired when I first walked in. I had decided to come here to meet a new exchange student from the states, Lauren, and chose it just because it is right in the city center and would be easy for a newbie to find. I have no idea how I never saw it before and was a little sad that a Coffee Company was across the way; those are basically Starbucks’ and probably steal a lot of business. 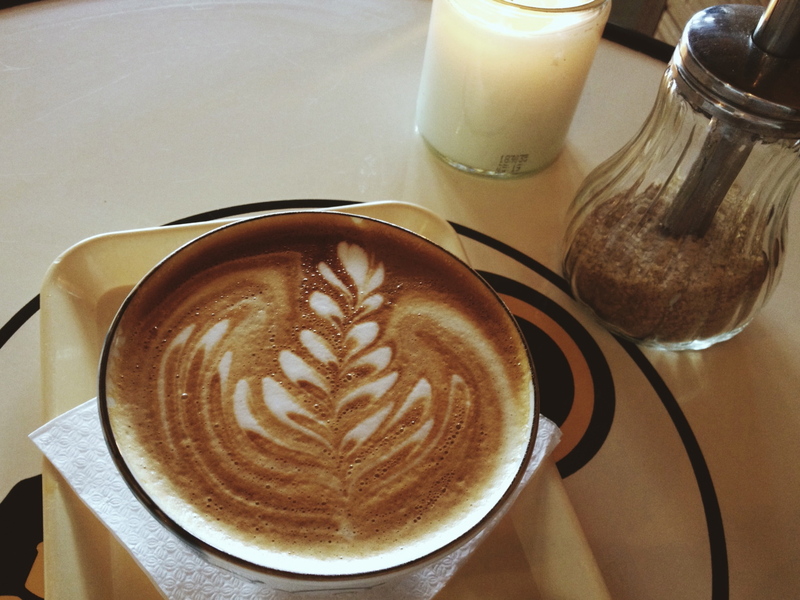 I ordered a cappuccino (duh) and it was delicious as well as beautiful. Lauren ordered a beautifully crafted hot chocolate because she’s “not yet a coffee person,” but just give her a few weeks! We talked about coming to Amsterdam and I really enjoy sharing my knowledge with those that are new and lost; I wish I had someone like me to tell me the little things that help tremendously. My favorite part was when Lauren said she hadn’t been to the Red Light District yet and would probably go during the day first, then at night. I immediately said “girl, we are in the middle of the RLD right now!” So obviously, it’s not nearly as threatening as newcomers think! Outside of KOKO, beautiful of course! Cappuccino in a bordeaux mug with saucer…. found my place! 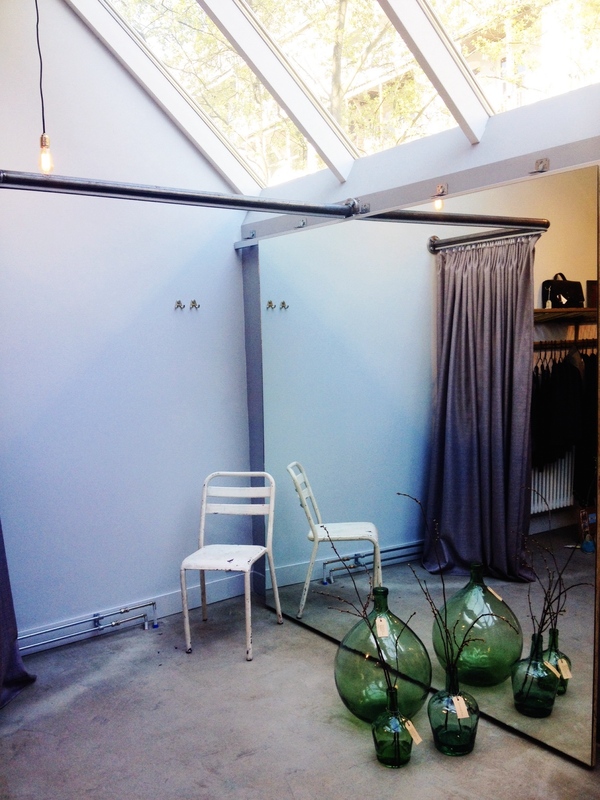 The dressing room area of the store. 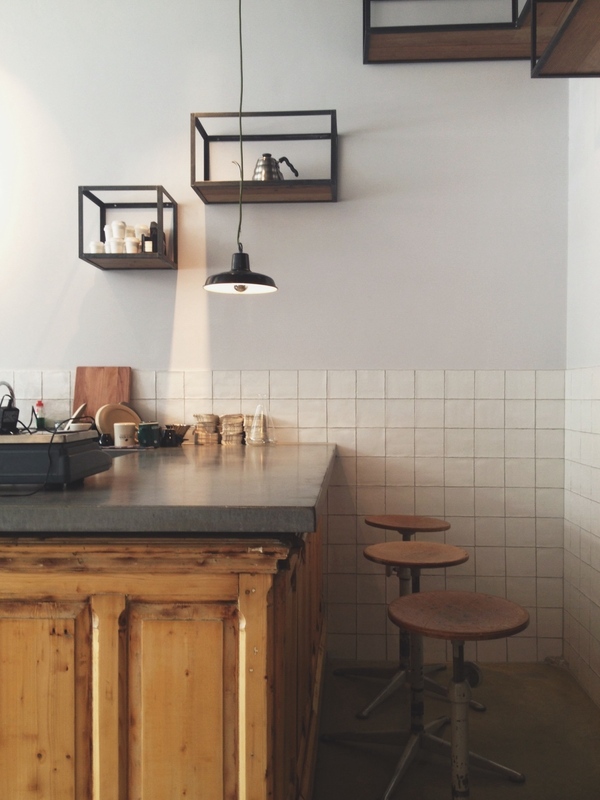 Minimal and perfect, like most Dutch things. My sister is in town! We spent the day in south/west amsterdam (de pijp, museumplein) and ended it with some coffee on the way home. 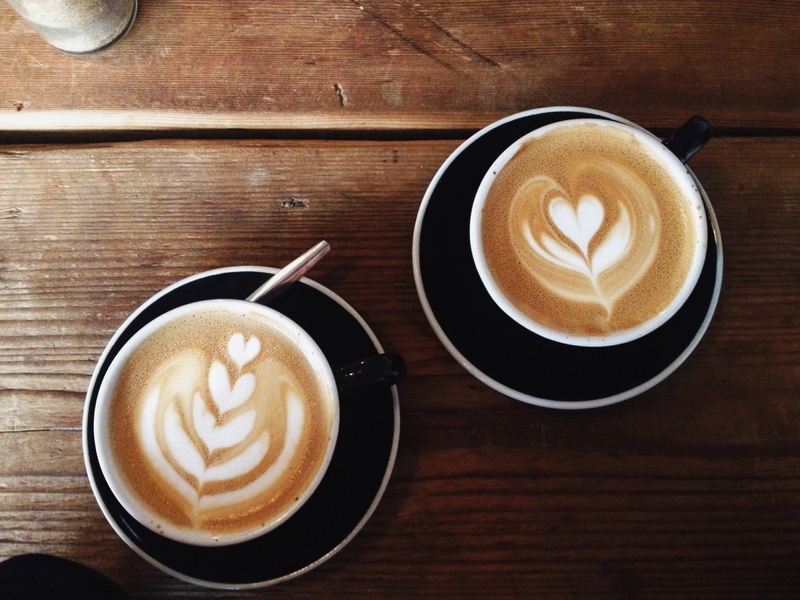 Trakteren was on my list but Anna found it online because it’s known as having the best latte art. Obviously we had to go. Afterwards we explored that neighborhood a bit more (Overtoom/west Amsterdam) and then went home because we were tired and had macarons to eat. Coffee doesn’t help me out much anymore in terms of caffeine…either that, or naps will win out every time. 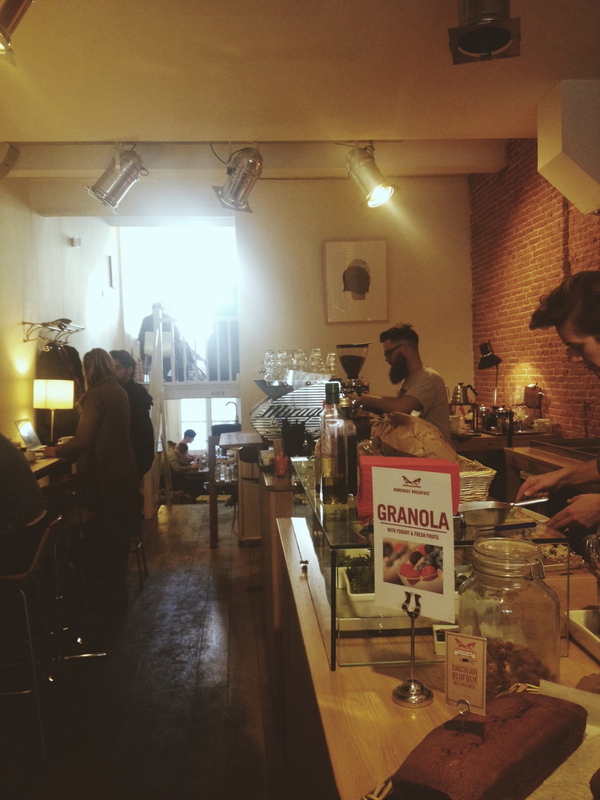 Trakteren was definitely the most local and casual coffee place I’ve been to, less of a piece of art and more just general drinks. They sold a lot of coffee, tea, and chocolate too. I got a cappuccino while Anna got a chai macchiato. A lot of the things on the menu had “tip!” next to them and we couldn’t figure out what it meant… but then realized it means “suggestion” rather than having to pay extra. You just don’t ever know… lost in translation I guess. 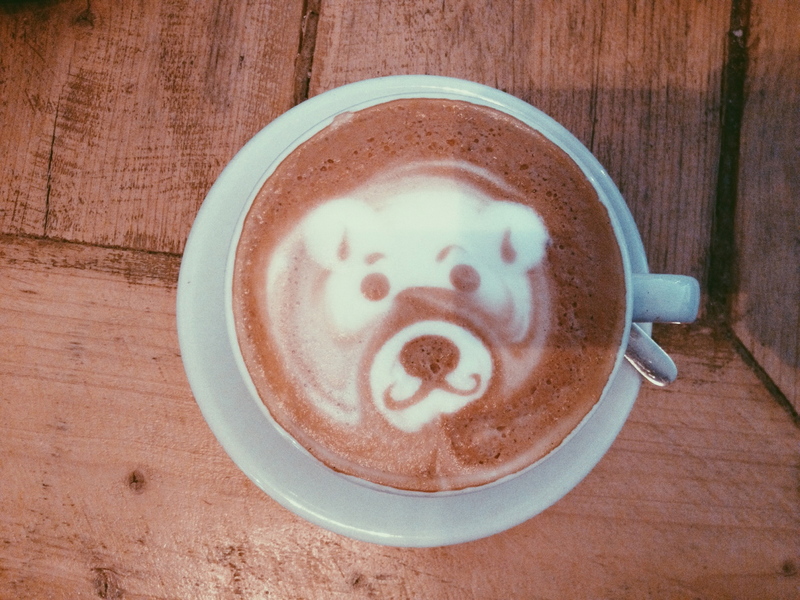 My latte art was definitely cute; it was a little teddy bear face. After google image searching Trakteren just now, I realize that’s a common design for them. It’s ok though, still adorable. Again with a win on Utrechsestraat! Bar Moustache is pretty much right across from de Koffie Salon (which we just found out is actually a chain with at least 2 other locations, jammer!) and Anna and I stumbled across it because we wanted some lunch. 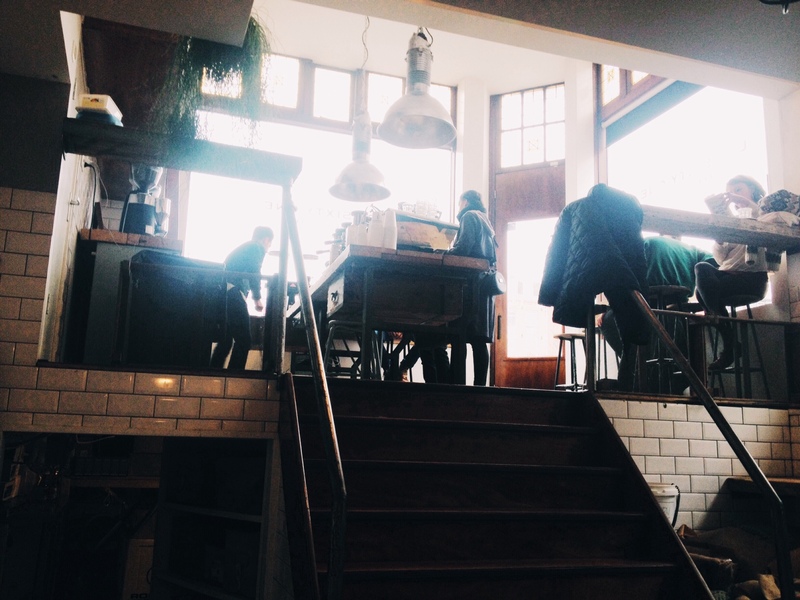 It is more of a cafe than a bar, with cute tables and an upstairs–typical. I got a cappuccino and Anna got a chai latte. The food at Bar Moustache was fantastic as well. I had the winter salad and anna got the “Porky,” pork on pita. Sorry, no pictures. The food was gone too fast for that. Bar Moustache reminds me of a restaurant Anna and I went to on Sunday night in Javaplein; the actual restaurant is surrounded by Febos, dry cleaners, and smaller shops. 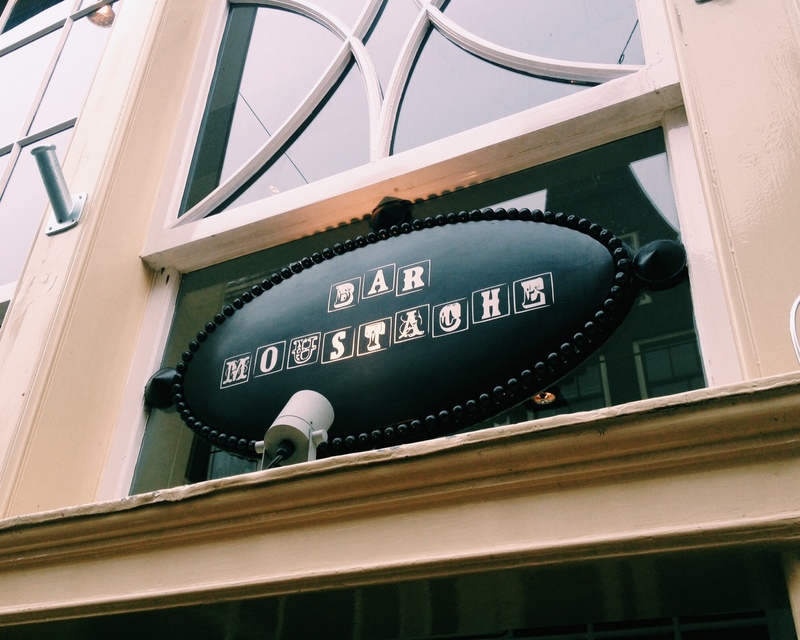 It is surprising how nice the Wilde Zwijnen (javaplein restaurant) and Bar Moustache were despite their surroundings. They are also filled with adorable and hip Dutch people. Diamonds in the rough, I guess. I’ll definitely be back to Bar Moustache for food and maybe for drinks if it’s a happening place into the night. Just pondering! Photograph by Anna. Definitely a favorite place now, and Sweet Cup comes equipped with a big ol’ basset hound! 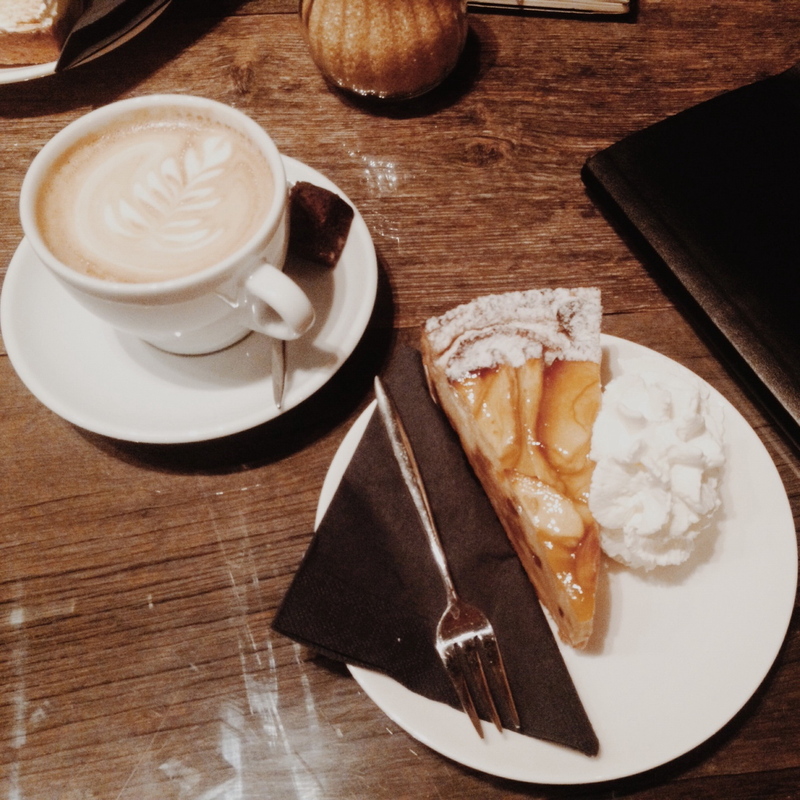 Although getting to Sweet Cup involves trekking through one of the biggest tourist areas of Amsterdam, Leidseplein, it’s well worth it. I found Sweet Cup on The Makers, again, and like always, Margot made a great discovery. Nat and I wanted to go there primarily for the residential dog (Sjef) that is even included in their logo, but we stayed for coffee and to get some reading done. The weather was perfect today which made the journey to southwest Amsterdam beautiful. Although there isn’t outside seating at Sweet Cup, the interior was still cute in the sunlight. The coffeehouse has a slight cowboy theme which is really comforting. There are cacti on the 2 wooden tables and pictures of the west hanging on the walls. The owners are an adorable couple and great doggie parents. Sjef comes into the living room-style cafe everyday I believe. He likes to eat his lunch there and play with the ball. According to the owners, pictures that Sweet Cup is tagged in are half of coffee and half of Sjef. He’s too sweet and adorable NOT to take tons of pictures of! Nat and I will definitely be coming back here to study or relax. We were the only customers for the time we were there, and it’s best that way! Natty getting ready for heaven! Oh no, I cheated on Amsterdam! It was only a short affair and I don’t feel guilty about it. 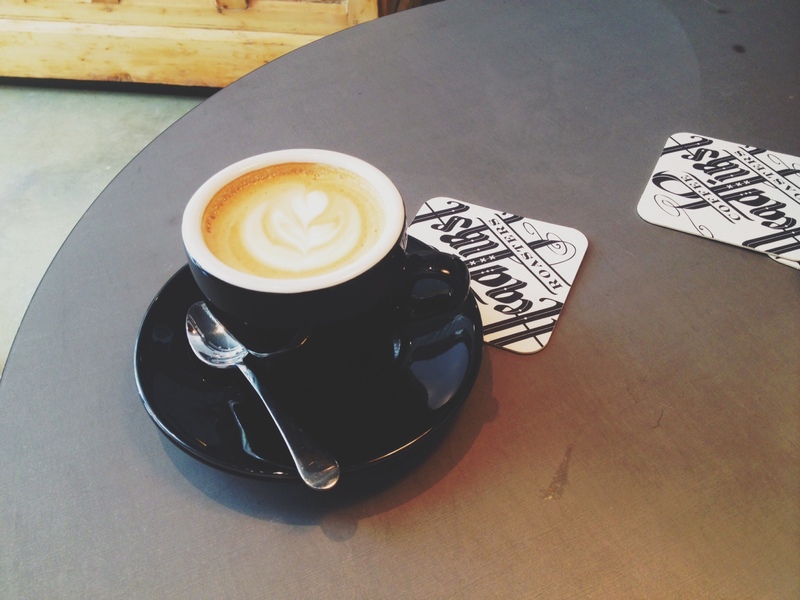 I have another blog post on the trip itself, but Rotterdam is modern and cool, so of course it has a few coffee gems. We had to walk past some street art and under the train lines to find Lokaal, but it was very close to the city center but still away from the main area. The shop is located in a type of complex, and as soon as we saw the stores surrounding it (a jazz bar called “Bird,” a conceptual business clothes store) we knew we had found it. 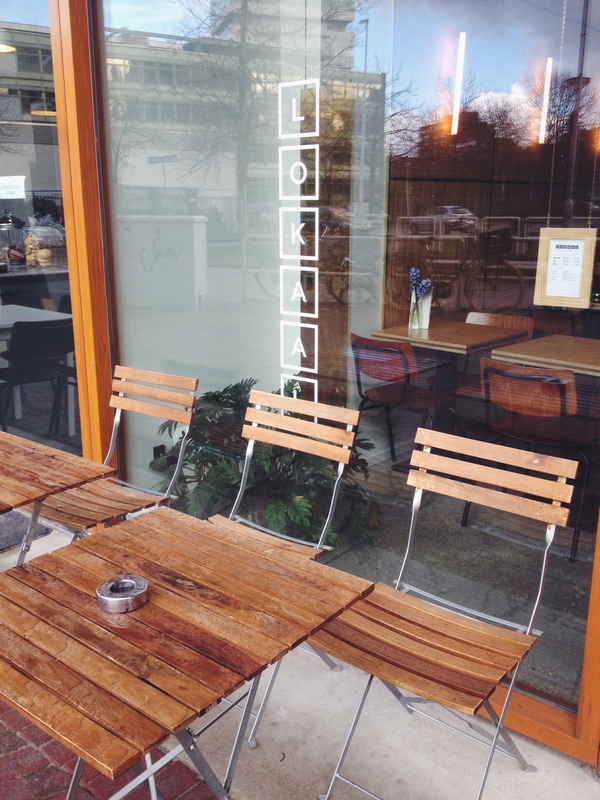 Unlike homey feeling Sweet Cup, Lokaal was more cleaned up with fresh flowers on every table and beautiful woodwork. I had a cappuccino and Nat had a latte, she’s been switching up her order but I’m staying consistent. 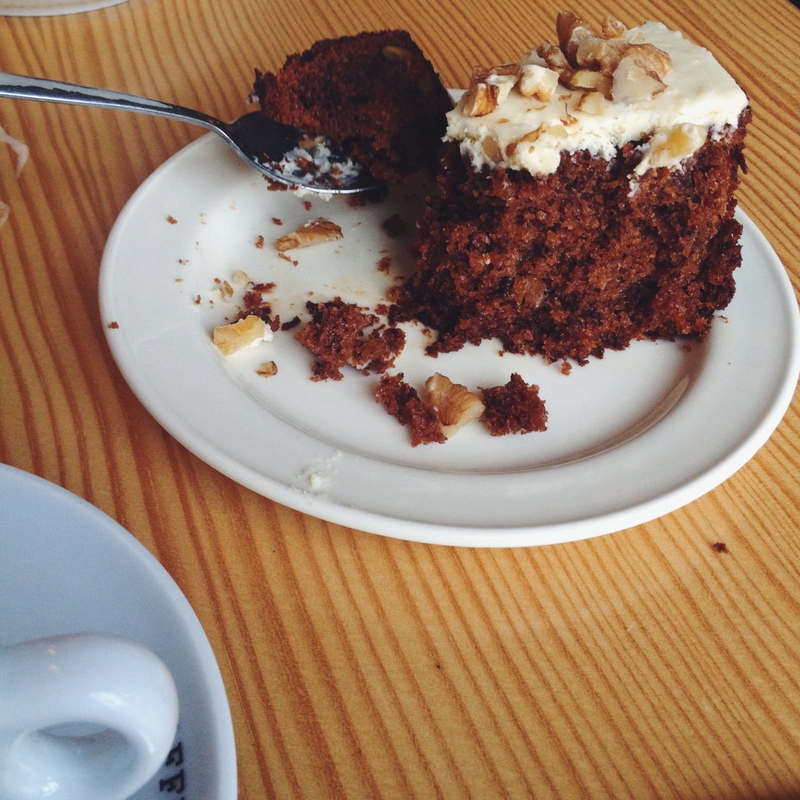 The coffee was great but I think the carrot cake Nat and I shared was even better. Not sure if I’ll make it back to Rotterdam before I leave the Netherlands, but if I did, I would definitely go back to Lokaal. Couldn’t get over the cute dishes they used! What a corner of my future house will look like! 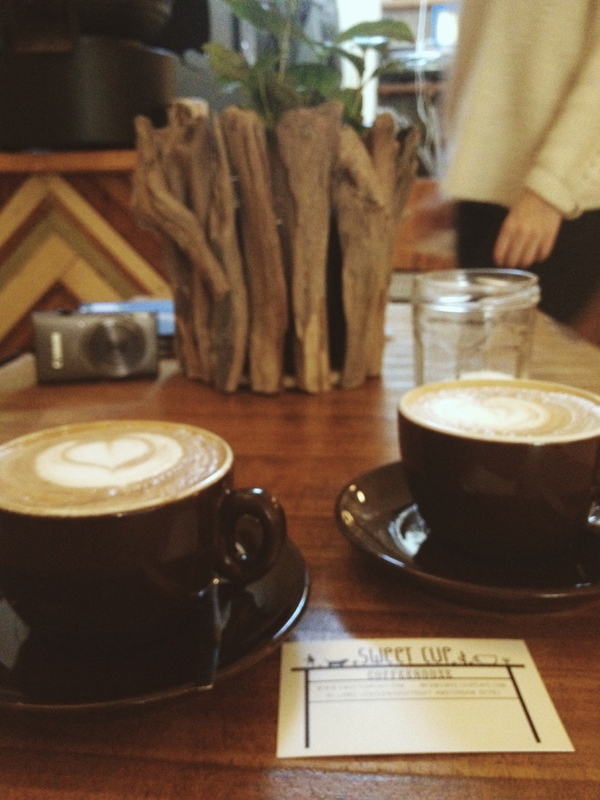 We finally arrived at the coffee place we hear the most about on blogs and instagram, Lot Sixty One! They roast their own beans and sell them too. The cafe is in a great location with a neat set-up; you enter on one level with the bar and some seating, then can sit at a larger table on the lower level. It feels like you’re in a little coffee cave, surrounded by what I assume to be large coffee equipment. I had two cappuccinos (uh oh, moving up on quantity here) but I also had a lot of work to do. We were there for about 3 hours anyway. I think what I’ve learned most from all of these concept stores and coffee brewers is that they really love what they do. They love coffee and they love their customers. Whereas at a Starbucks you have a huge variety of people, I think these cafes we’ve found (aside from de Koffie Salon which as I’ve stated is indeed a chain) showcase a specific type of owner and customer. Everyone is quiet and simply resting or enjoying themselves. No one is talking loudly or gossiping. A worker at Lot Sixty One was making a batch of cookies literally right next to us (sharing the table) but with about 9 seats total, what can you do. 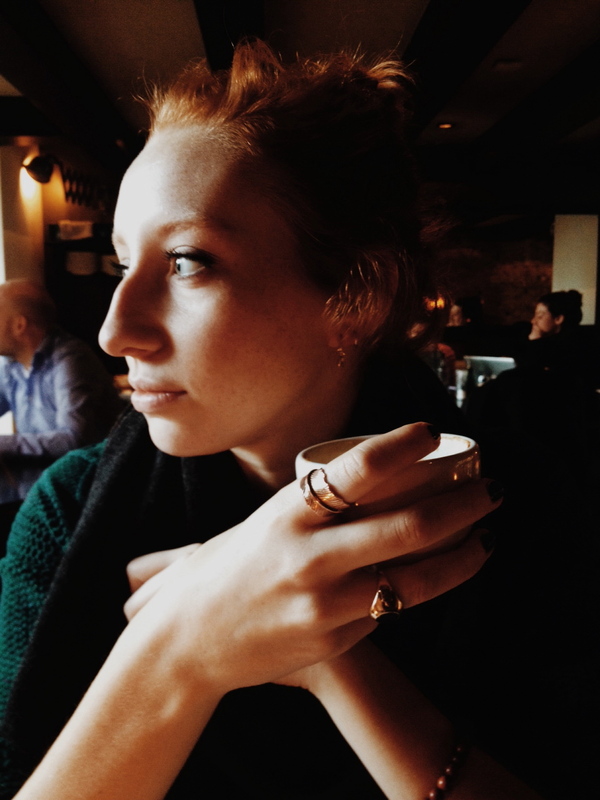 Lot Sixty One was the perfect location to spend a chunk of this rainy Amsterdam day. The friends are here! My friends from high school, Andrea, Alison, and Sarah, came to visit me this weekend. 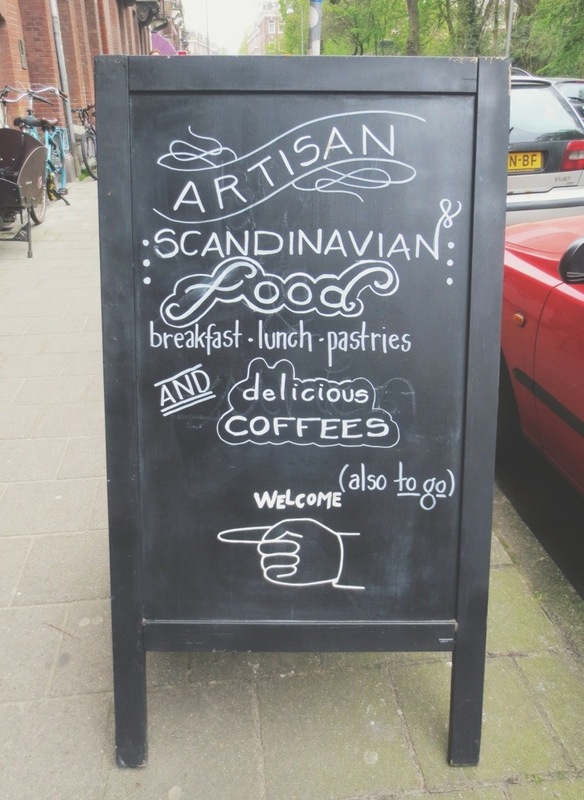 Since we were already exploring De Pijp, one of my favorite areas, we stopped into Scandinavian Embassy which Esquire claims to be the best coffeebar in the Netherlands. 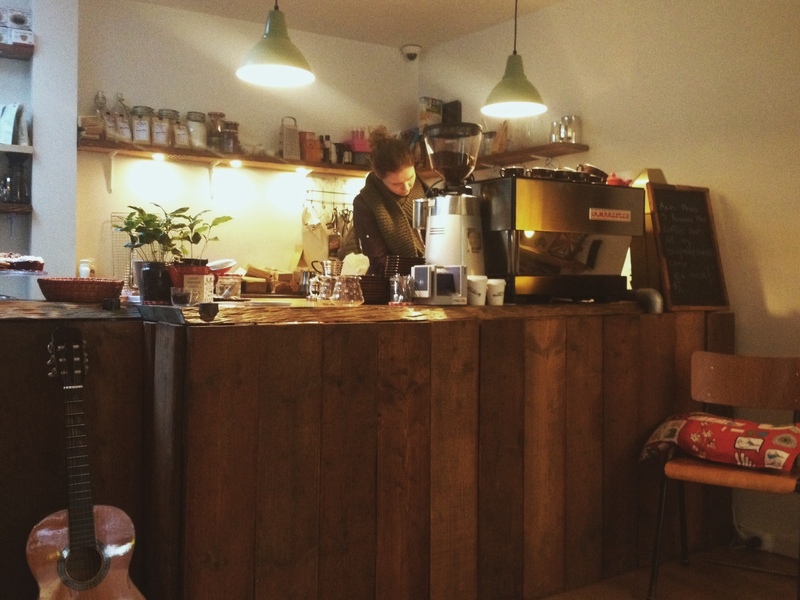 It’s mission is to showcase speciality coffee in a Scandinavian-based environment. We were greeted by Rikard, the head chef, but our actual coffee was brewed and served by Nicolas (2013 Brewers Cup Champion of Sweden). 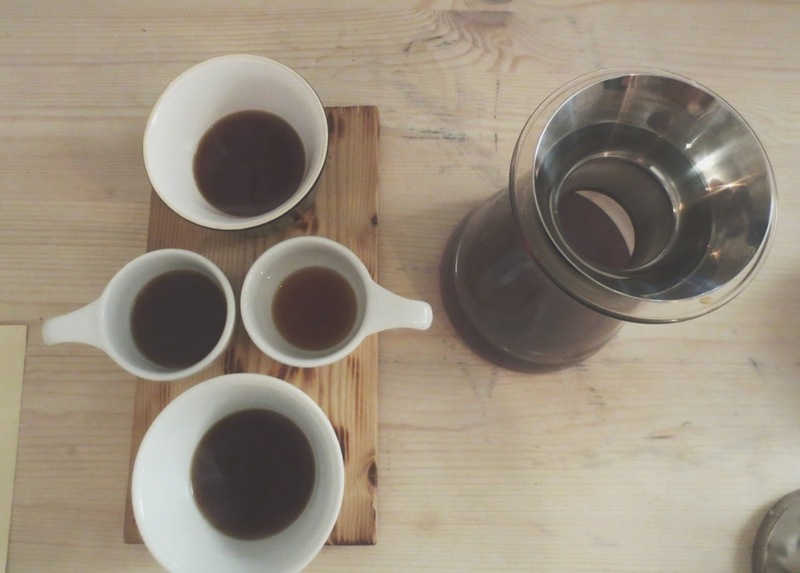 They suggested that we try two types of filter coffee, we went with the Ethiopian and Brazilian. It’s all about the tasting. Now, here’s my issue. If I liked black coffee, I could have really enjoyed this experience. The coffee was more of a coffee-tea combo, and I enjoy my espresso-milk combo that just tastes sweet and unhealthy with a lesser coffee feel. 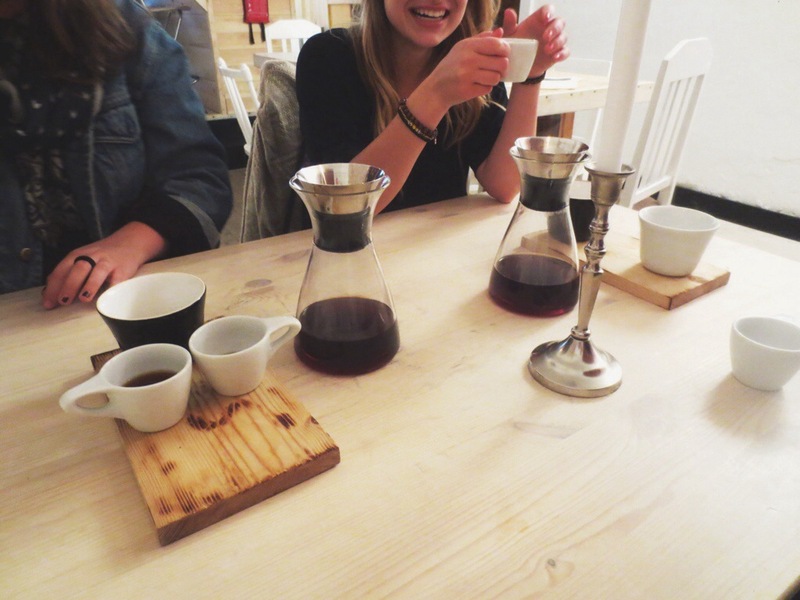 BUT for what our experience was–tasting REAL coffee and enjoying all of the flavors–it was a great experience. 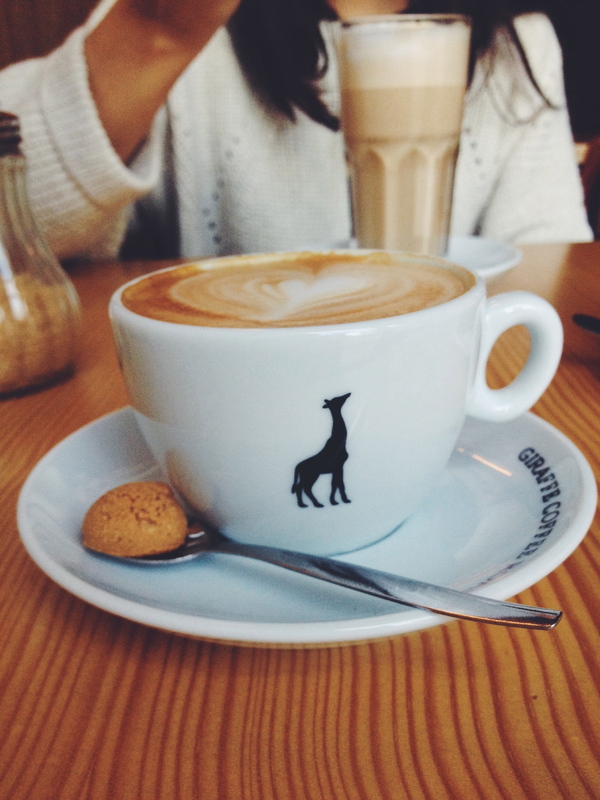 The Ethiopian coffee had hints of strawberry and lavender, and the Brazilian was richer with hazelnut and chocolate. Still, like wine, I don’t really understand taste or smell components. I was still so happy to share one of my favorite Amsterdam hobbies with my friends. I had forgotten my phone at home, so Andrea was nice and let me borrow her camera to document the experience! I think it’s fair to say I have become a part of the Amsterdam ‘Instagram scene,’ and I’m quite ok with that. We seem to run together, going to the same cafes, ‘liking’ each others posts, a community of coffee lovers and people that like to spend time (and money) on neat things. 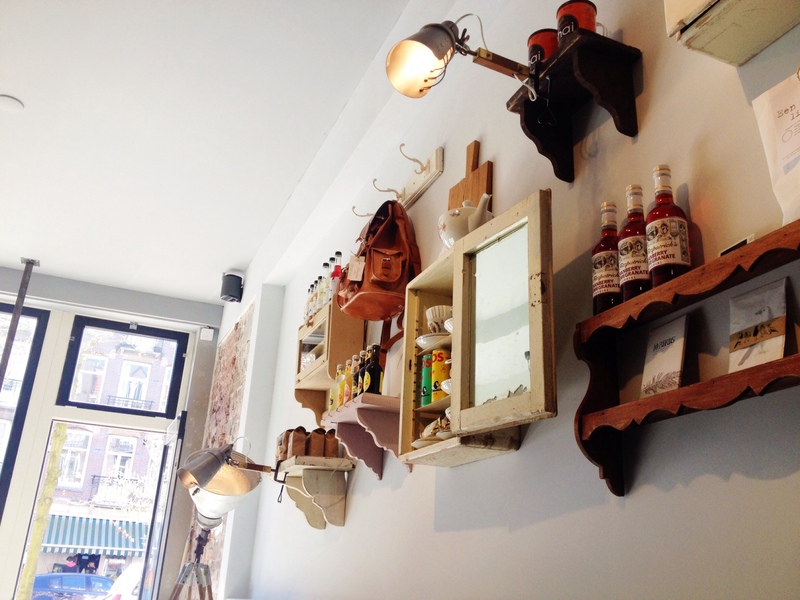 I had read about Hartje Oost on the website http://www.yourlittleblackbook.me, a travel blog/site that covers a lot of cities. 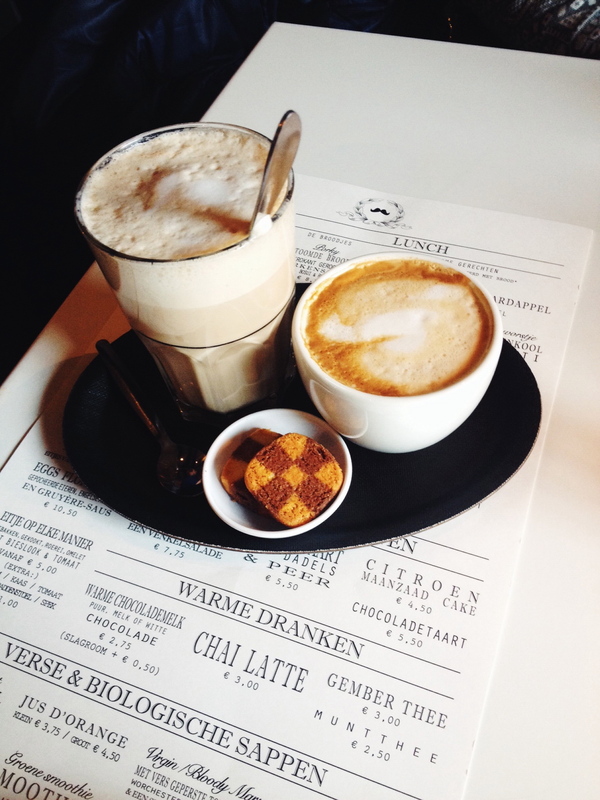 The blogger is settled in Amsterdam, so she has a ton to offer on this city in particular. 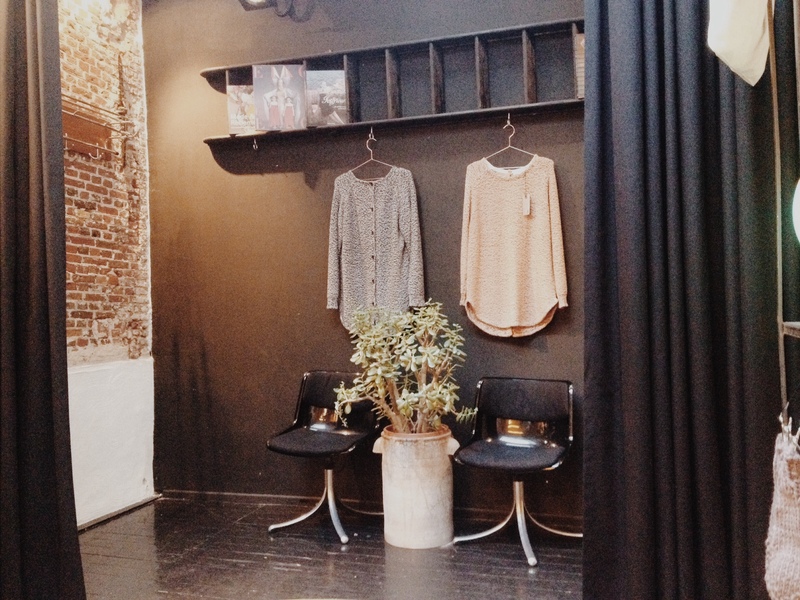 I also saw it on Amsterdam Curated, another favorite blog to find cool things. Anyway, I saw some Instagram posts from Hartje Oost and figured I had to go. Sonal was with me this week, and after we spent the morning at the botanical gardens, we travelled a bit further east to Hartje Oost to get some coffee and do some necessary homework, I am still a student after all! My flat white (twice as much espresso as a cappuccino with less foam, I learned this from the girls that worked there) was really yummy, but I think the layout and look of the store is what got us the most excited. It was really stunning and beautiful in the sun, with an open glass roof over part of it. Their lemon cake was also an awesome treat to share. So awesome, that I dipped my entire sleeve in my coffee on accident and the two workers helped me clean up. One of the girls said it had to be the day, or the moon, because she had cut her hand earlier that day. Then we realized it really was the moon, because an eclipse had just taken place. Freaky and relevant and conceptual. What a fun little trip to the heart of the east! This was a cafe bucket list original, but Headfirst Coffee Roasters only re-opened about a week ago in a new location. Today was a little rainy, and I have a lot of research to do, so Nat and I took a quick ride down to Westerstraat (close to home!) 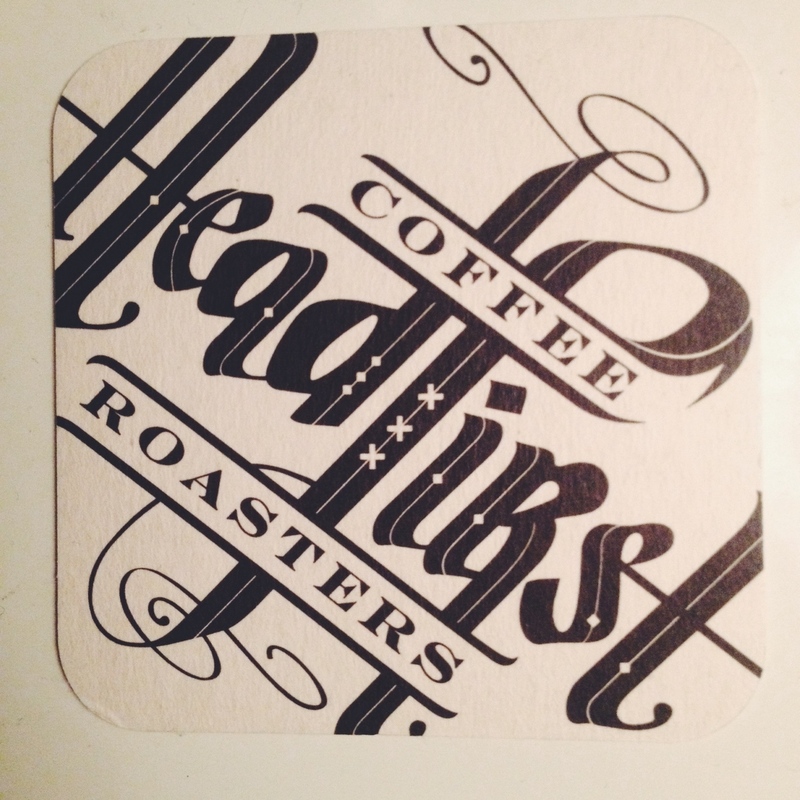 to get coffee from Headfirst and a stamp from one of the last places on our koffie kaart (coffee card). Since Headfirst is so new, is was definitely pretty bare. There were a few croissants on the counter but no other treats. Their coffee menu had about 7 options I’d guess, the very basics and minimal, but I’m not complaining! 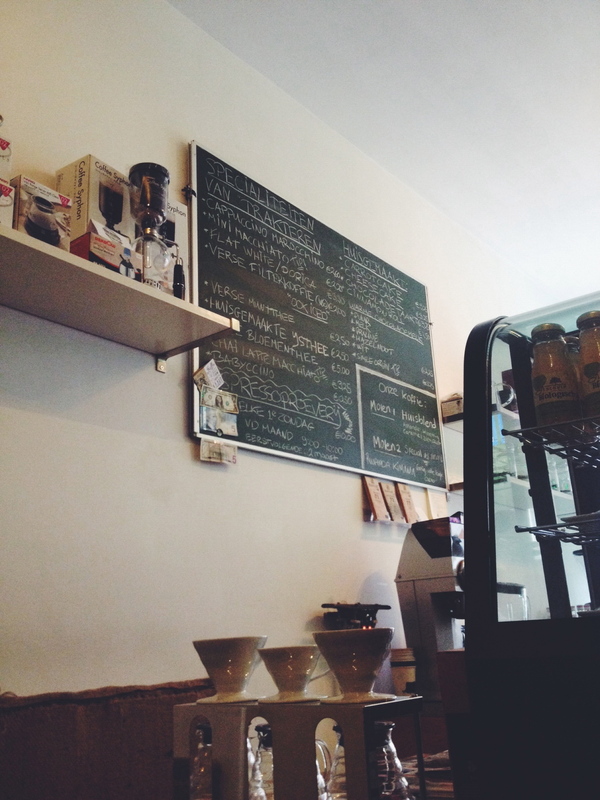 The back of the cafe, however, had an extensive coffee set up for roasting beans that they sell in store. My cappuccino was good but small, I’m spoiled by big drinks in America, and unfortunately really miss this aspect. Luckily I can get a cappuccino the size of my face at Bagels and Beans. But this part of the list is supposed to be about Headfirst! I think I’ll stop back in before I leave the city (almost a month away…) and see how things have progressed. This was the first coffee place I’ve been to that has their own coasters, like a bar. It’s a really cool idea. Next time I’ll try their real coffee. I just can’t get over the good, milky, sugary stuff. Guess I’m not that much of a coffee snob after all. Wow, cafe number fifteen. I feel like this is the end, that’s a great number to end at, and now I can return to my favorites for the last few times I need a coffee break (!!). I ended up near Oosterpark (in East Amsterdam) to meet with a friend for lunch, and decided to include Coffee Bru (literally across the street from lunch) to the agenda, since I don’t spend that much time in East when I don’t have to. This was the last stop of my coffee card, and it feels great to have completed it! I would have felt horrible leaving Amsterdam with the coffee card unfinished! Coffee Bru was packed for an afternoon of working and lunching. It was in the equivalent of a strip mall (with lots of construction around it), but still a little oasis. Luckily, some room at the big community table in back opened up where Nat and I could sit. 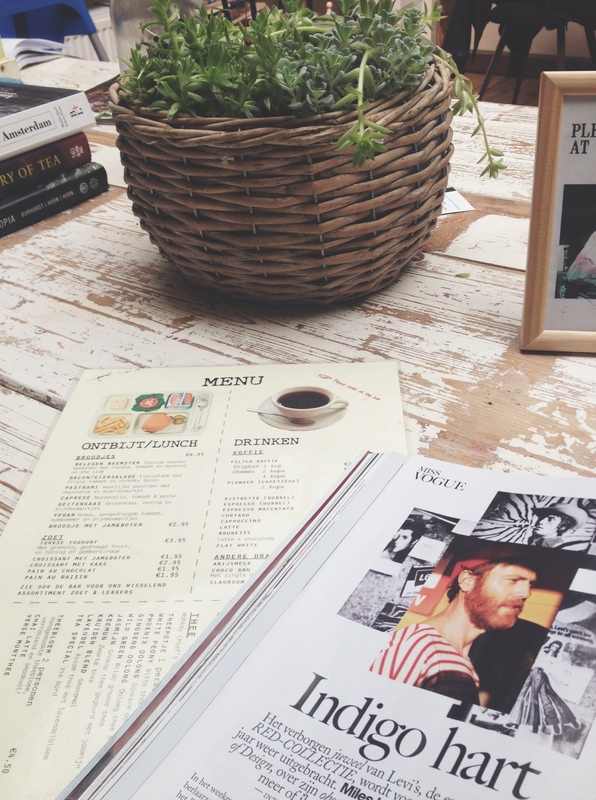 We looked at Vogue Nederland and drank cappuccinos. What a perfect afternoon! I loved the interior. There wasn’t a common theme or anything, just cute with lots of plants. 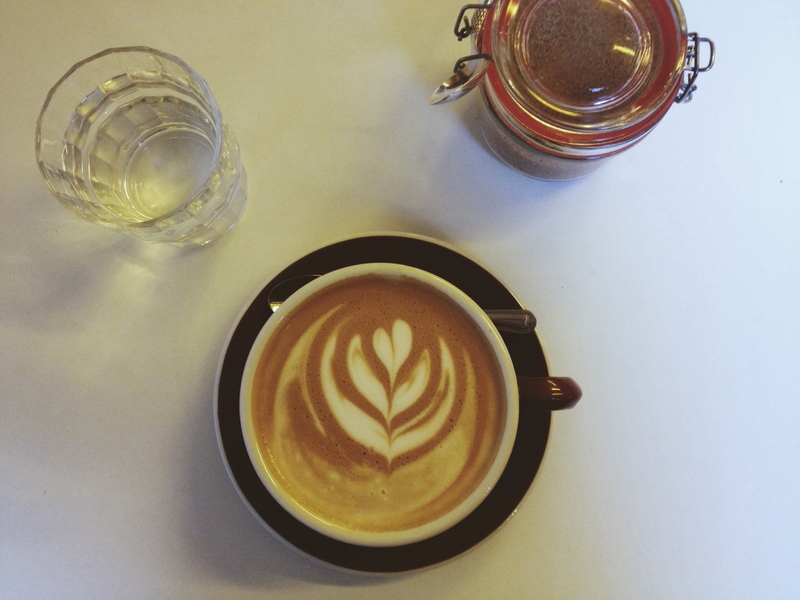 The coffee was good (and pretty) too! I really enjoyed looking at all of their desserts, but just had a big lunch and didn’t go for one. When the woman offered for us to get Coffee Bru frequently buyer cards, I had a little moment. I wouldn’t be in Amsterdam long enough for that to make sense! That was sobering… but something I just have to accept. Stalker picture of the community table before a spot opened up… maybe it got the dude to move! Menu and Vogue, two of my favorite things to read! Miss you too, but so excited for your life-changing trip to start as well!